Our product range includes a wide range of landons retractor. 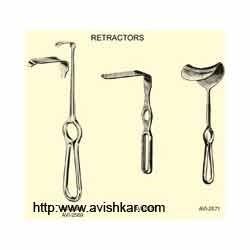 Landons Retractor offered can be made available by us in different finishes like in normal stainless steel and tungsten carbide, in tungsten carbide and other choices. Further, these surgical instruments are of theatre quality and fully reusable. Some of its features include coming manufactured using correct grades of stainless steel; suitable for use in dental and surgical instrument; used in applications requiring superior wear resistance and strength; provides for long service life.